Books are more than just containers for information and stories – they’re also an amazing resource for artists looking for a new creative medium. 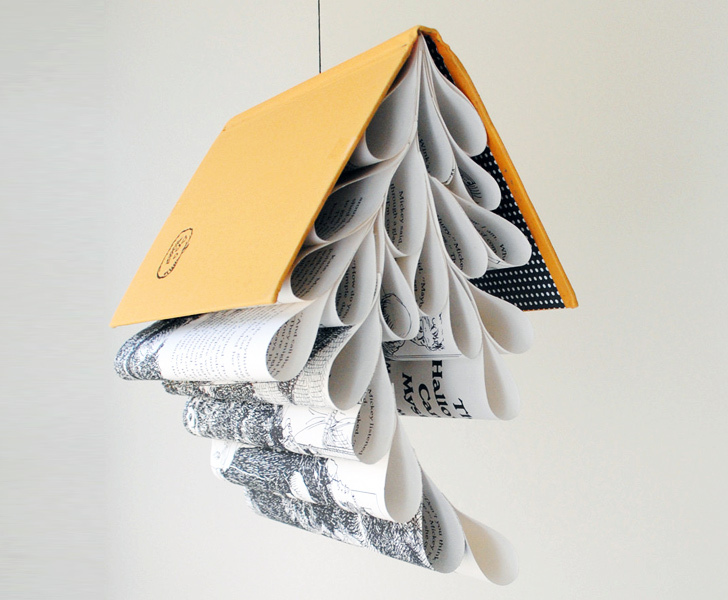 Lisa Occhipinti repurposes old, abandoned books from flea markets and libraries into sculptural hanging mobiles. At a time where many readers are making the transition from hardcover to e-reader, her bookmobiles recall a time when page-turning required a piece of paper instead of the swipe of a tablet. Drawing upon her background in bookbinding, Lisa Occhipinti rescues unwanted volumes for the use in her bookmobiles. She salvages most of her material from flea markets and thrift stores, keeping an eye out for linen-bound novels printed in the early to mid-twentieth century. She begins by ripping off their spines and rolling the pages, causing them to resemble tear drops or the spirals of a shell. Coated in beeswax, the leaves of the books take on the shapes of fossils or the falling branches of a tree. Taking advantage of simple covers, mid-century design elements, and typography, the artist showcases the “quiet display of design that seemed devoted to that of books”. Occhipinti is also the author of The Repurposed Library: 33 Craft Projects That Give Old Books New Life. Those interested in purchasing her bookmobiles will find her work through her Etsy site, The Shophouse. Books are more than just containers for information and stories - they're also an amazing resource for artists looking for a new creative medium. 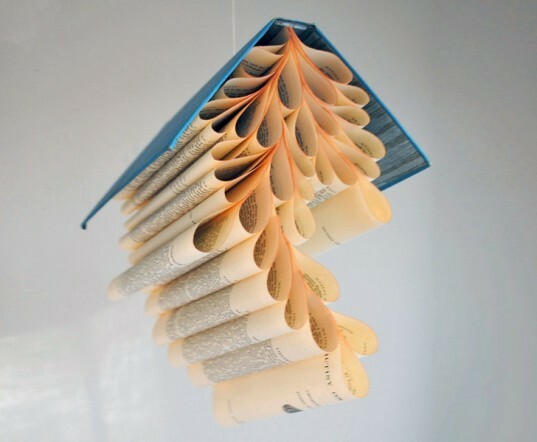 Lisa Occhipinti repurposes old, abandoned books from flea markets and libraries into sculptural hanging mobiles. At a time where many readers are making the transition from hardcover to e-reader, her bookmobiles recall a time when page-turning required a piece of paper instead of the swipe of a tablet.